The Bulldog Marching Band’s two Bulldog Beat groups will celebrate their 15th anniversary with a performance at 8 p.m. Friday, Feb. 13, at California State University, Fresno. The Uptown Bulldog Beat and Downtown Bulldog Beat groups will play old favorites and new selections, and special guests will join them at the Concert Hall in the Fresno State Music Building. 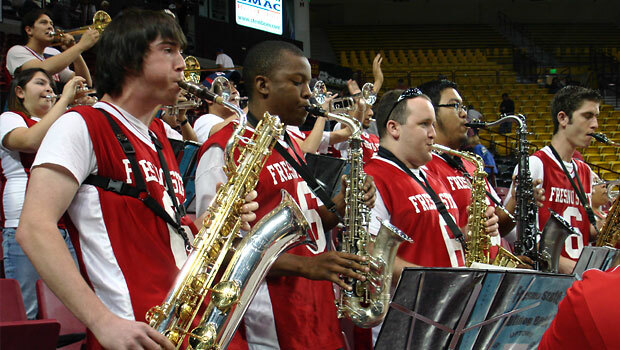 The 16-member Uptown Bulldog Beat and 17-member Downtown Bulldog Beat are the scholarship groups established by Dr. Gary P. Gilroy in 1993 to perform at basketball and volleyball games and on-campus events. Gilroy is a professor of music at Fresno State and the director of bands. Tickets for the celebration concert are $6 general public, $5 for seniors and for Fresno State staff and students. Options for large school groups are available. Free parking will be available in lots C and V.
For more information, contact Timothy Anderson, associate director of bands, at 559.278.2260 or tanderson@csufresno.edu.